Anyone who has visited Amsterdam during December or January will know that the Dutch love to brighten up a cold, dark, winter evening with an impressive display of lights. I mentioned to the couple I was staying with that I was interested to find out more and hopefully see all the lights before I returned home and so they booked for us to go on a cruise around the festival. So on a slightly milder evening in January, we met on the dock near central station and boarded our boat. For only 20 euros, we got to cruise the canals for one and a half hours and we even had some drinks included in the package! Our captain was friendly and professional and provided us with lots of information about the installations we stopped by on cruise. I would like to share a breakdown of the information about my favourite artworks that we saw along the way. 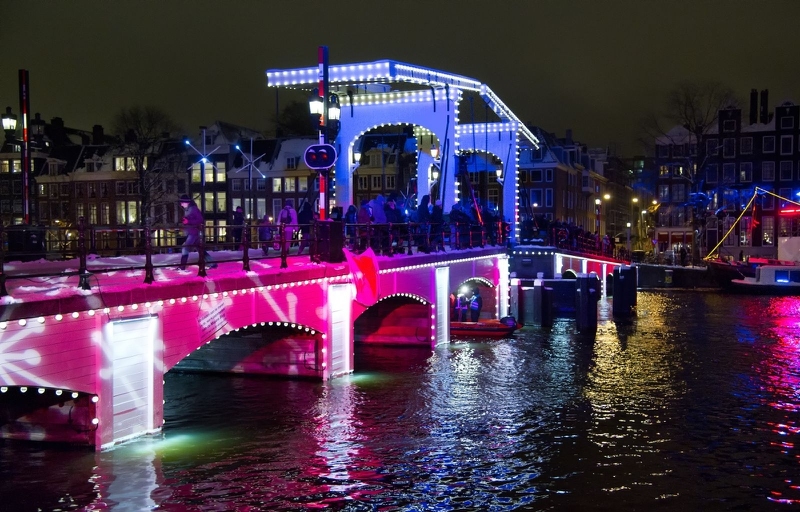 I urge you to check out pictures online and find out more about the artists and perhaps next time you are in Amsterdam for a winter break, you will be inspired to see the next edition of the light festival! We experienced this as we turned a corner on our cruise and it unfolds beautifully. First you see a rather unimpressive bike tire made of lights on a rope of light as if it is being pulled out the water. As more is unveiled you see numerous bikes and parts of bikes being pulled out of the water. This design is an ode to the many bikes that fall into Amsterdam canals every year, of which 15,000 are recovered annually by the Dutch government. This French artist beautifully captures this natural phenomenon and cleverly incorporates it into a bridge. The rainbow is said to be representative of Amsterdam’s pioneering support of the LGBTQ community. It is truly dazzling in all its bright colors but I don’t think I could stare for too long after one too many drinks! The whole idea of the light festival is to brighten up the doom and gloom of winter and what better way to do that than to remind you of the coming spring and summer and the flowers that will bloom then? This is a country known for its vast fields of flowers and this artwork tries to capture the feeling of seeing this by placing a long strip of flowers along the canal that are set to light up as you go past. It creates a sunny and traditionally Dutch vibe. I am a supermodel and I love Kim. Travel is my passion, have been around the world, love to write and share my stories.